Today: Nothing left in the fridge for dinner? Think again. You, like me, probably went to the farmers market or the grocery store on Saturday and dutifully bought what you were sure was a week's worth of produce—but now it's Tuesday, and suddenly you, like me, are probably wondering where all the kale went, and at what point you managed to use up all of the tomatoes, and how your loaf of bread grew stale so quickly. The same fridge that you packed so full on Saturday is looking pretty sparse. You might be thinking that you need to make a pit stop at the grocery store on the way home tonight. But wait! That stale bread you have—it's just what you need for panzanella. And if you have a cucumber, a handful each of arugula and basil, and a red onion rolling around, you have everything you need to make a speedy, elegant bowl of Bronzino's Green Panzanella. You'll be spared a trip to the store and still get a dinner that makes you feel like you're getting in your greens. We are assuming you already have half a loaf of stale bread, red wine vinegar, and olive oil. If not, add those to your list, too! With 20 minutes until dinner, slice 4 to 5 pieces of the stale bread, pass each under running water, and place them in a bowl. Slice the onion, sprinkle it with a tablespoon of red wine vinegar, and cover with water. Let the bread and the onion sit in their bowls for about 10 minutes while you slice the cucumber and consider a pouring a glass of wine. All you have to do is assemble—just a few more minutes to go! 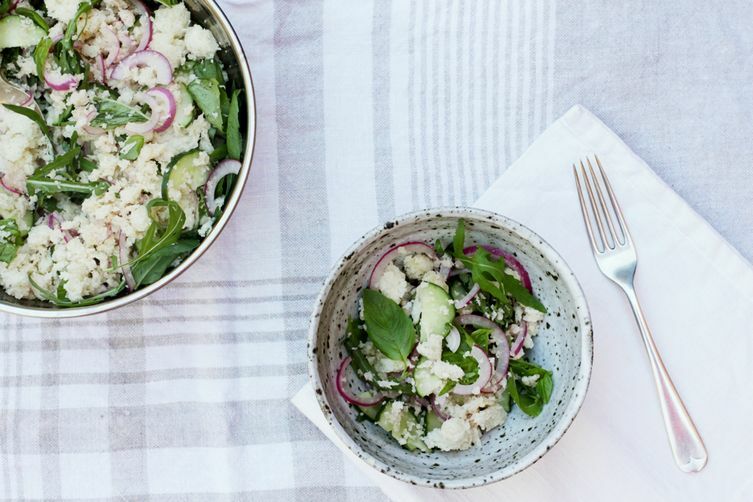 Crumble the bread with your hands and place it in a bowl with the cucumber and arugula. Drain the onion and add it to the bowl along with a long pour of olive oil and red wine vinegar, salt, and pepper to taste. Top with torn basil leaves and scoop generously into bowls to serve.